Batman stopping by Arkham to check in on Poison Ivy and Harley Quinn. Harley Quinn is one of DC’s most iconic characters—and it all began with her first appearance in Batman: The Animated Series. DC Universe’s upcoming Harley Quinn series is taking the antihero back to her animated roots, and the show’s first trailer is a delightful peek at just what all we can expect from this incarnation of the character. 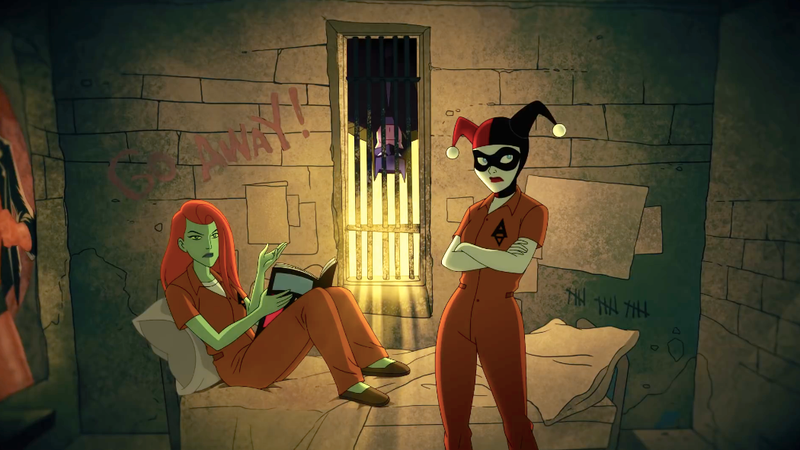 As is often the case, Harley’s (voiced here by Big Bang Theory’s Kaley Cuoco) in jail once again and bunking with Poison Ivy, but rather than simply scheming about how they’re going to breakout, the Harley Quinn teaser establishes the show’s meta-ness by having the pair speak directly to the audience about the big picture. Ivy’s (Lake Bell) not convinced anyone’ll actually like Harley Quinn, but Harley’s confident we will if for no other fact that it isn’t a depressing drag like many of DC’s other series and, unlike FX’s once-planned Deadpool series, the Harley show’s actually going to be released to the public. It’s lifting a little from Deadpool’s book with its wall-breaking schtick, but it works perfectly for Harley. DC Universe’s Harley Quinn premieres in 2019.